The Minneapolis office of Weber Shandwick announced the promotions of six employees in its Financial Services, Farm and Food Advocacy, Healthcare and Public Affairs practices. Christy Warner was promoted to Account Director in the Financial Services practice. Warner joined Weber Shandwick in 2006 and immediately took on the responsibility of coordinating many teams around the nation working on the U.S. Treasury’s Go Direct® account. Her leadership and problem-solving skills have proved themselves many times over in her growing role on the account, and have earned the respect of colleagues and clients alike. Warner holds a bachelor’s degree in journalism from the University of Wisconsin – Madison. Joni Written was promoted to Account Supervisor in the Financial Services practice. Written leads the partnership program of the U.S. Treasury’s Go Direct® campaign, focusing on outreach to national organizations including government agencies, professional associations and major financial institutions. She has also worked closely with non-profit partners such as the American Red Cross, the Salvation Army, and Community Action Partnership to direct and craft messaging in support of the campaign. Written came to Weber Shandwick as an intern in 2004, and since then her extensive knowledge of financial institutions has consistently been an asset to her colleagues. She is a member of the Public Relations Society of America and holds a bachelor’s degree in mass communication with an emphasis on public relations from Minnesota State University, Mankato. Spencer Anderson was promoted to Account Executive in the Farm and Food Advocacy group. His work has been central to the development of trade media relationships and online engagement platforms. Prior to joining Weber Shandwick, Anderson interned with an Iowa advertising firm as well as with Dow AgroSciences and Monsanto. He holds a bachelor’s degree in communication and agricultural education and studies from Iowa State University. Amy Devore was promoted to Account Executive in the Healthcare practice. Devore joined Weber Shandwick as an intern in 2009 and has since been a significant asset to the firm’s healthcare clients in their media monitoring and media relations efforts. Her expertise in the technical details of her clients work has helped her secure many significant local and trade media placements and successful award nominations. Prior to Weber Shandwick, Devore interned at University of Minnesota Academic Health Center, Wishes & More and at the University of Minnesota Medical Center, Fairview. 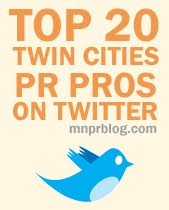 She holds a bachelor's degree in strategic communications from the University of Minnesota – Twin Cities. Emily Smolik was promoted to Account Executive in the Corporate, Community and Public Affairs practice. Since joining Weber Shandwick in 2008, her project management skills, writing skills and enthusiasm have enabled her to oversee several complex initiatives for the U.S. Army account as well as supporting legislative efforts for various public affairs accounts. Over the past year Smolik has served as the day-to-day support for Weber Shandwick’s pro bono work with the Economic Club of Minnesota. Previously, she worked in public relations at the Mall of America. She holds a master’s degree in comparative politics and conflict studies from the London School of Economics and Political Science and a bachelor’s degree in political science and Spanish from the University of St. Thomas. Collin Hurrell was promoted to Assistant Account Executive in the Corporate, Community and Public Affairs practice. Since joining Weber Shandwick, Hurrell has supported major U.S. Army events as well as multiple other public affairs and consumer marketing accounts. He holds a bachelor’s degree in mass communication from Miami University.